On September 15, 2017, at approximately 8:27 p.m., the Manchester Township Police Department responded to a report of a structure fire at 1 Ignatius Drive in the Renaissance development. Upon the arrival of Patrol Officers, it was reported that the structure was fully involved, as they observed flames protruding from the roof. 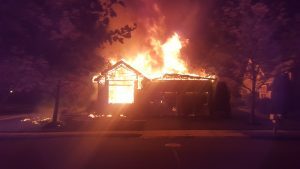 Officers received information from several neighbors that the two homeowners were still inside the residence, however, they were unable to make entry due to the intense heat, smoke and fire condition. As a safety precaution, officers evacuated several neighboring residences. Firefighters from the Whiting Fire Department, Manchester Fire Department, Ridgeway Fire Department, Lakehurst Borough Fire Department, Pleasant Plains Fire Department, and Toms River Fire Department’s #1 and #2 responded to the scene an extinguished the fire. After the fire was extinguished, the two residents, 82-year-old June Hollander and her 84-year-old husband, Warren Hollander, were located deceased in the master bedroom. As a result of the fire, the house was destroyed and several neighboring houses sustained minor heat damage. The Manchester Township building inspector, JCP&L, and NJ Natural Gas also assisted at the scene. EMT’s from Quality Medical Transport and Manchester First Aid responded to the scene where they treated two firemen for minor injuries. One fireman was transported to Community Medical Center in Toms River for additional treatment and evaluation. The exact cause and origin of the fire is currently being investigated by the Ocean County Fire Marshall’s office, the Ocean County Prosecutor’s Office and Manchester Police Detective Adam Emmons. The Ocean County Sheriff’s Office Crime Scene Investigation unit, and the Ocean County Medical Examiner’s Office also assisted in the investigation.